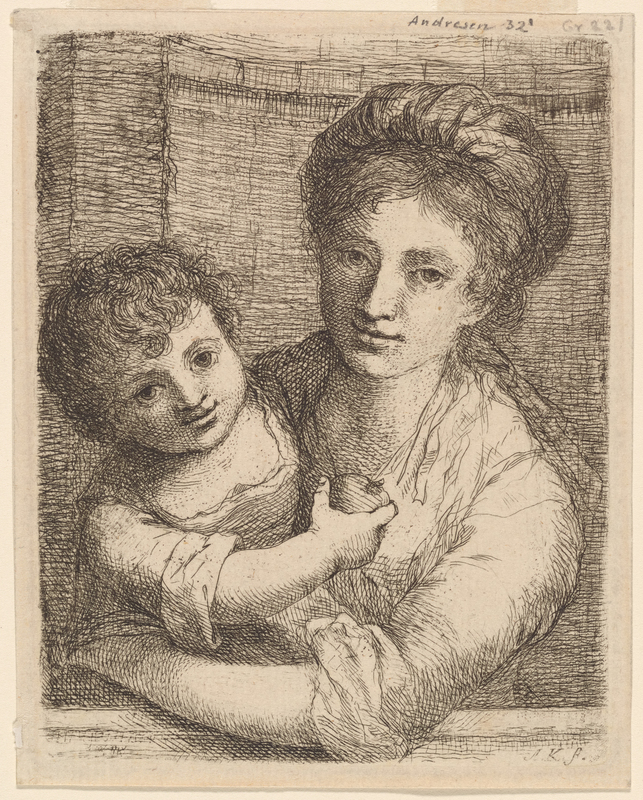 "Printing Women: Three Centuries of Female Printmakers, 1570–1900"
Angelica Kauffmann, Half-length Portrait of a Woman, with a Child Holding an Apple (1763), etching, image 24 x 11 cm, sheet 24.9 x 11.6 cm. The Miriam and Ira D. Wallach Division of Art, Prints and Photographs: Print Collection, The New York Public Library. At the age of just 18, a young Dutch woman named Henrietta Louisa Koenen (1830–1881) began gathering a remarkable collection of prints by and about women artists.1 In just over a decade, she amassed a collection that was remarkable in its scope and breadth; a catalogue of the collection upon its 1901 exhibition at the Grolier Club listed more than 500 prints by almost 300 artists.2 Koenen’s collection was prestigious enough to be acquired in 1900 by the noted art dealer Samuel Putnam Avery, who donated it to the New York Public Library soon after. Highlighted in the NYPL’s recent exhibition, “Printing Women: Three Centuries of Female Printmakers, 1570–1900,” Koenen’s collection remains remarkable, enlightening and surprising. The majority of the 80-plus works on view were drawn from Koenen’s collection, supplemented by key works from the library’s other holdings. 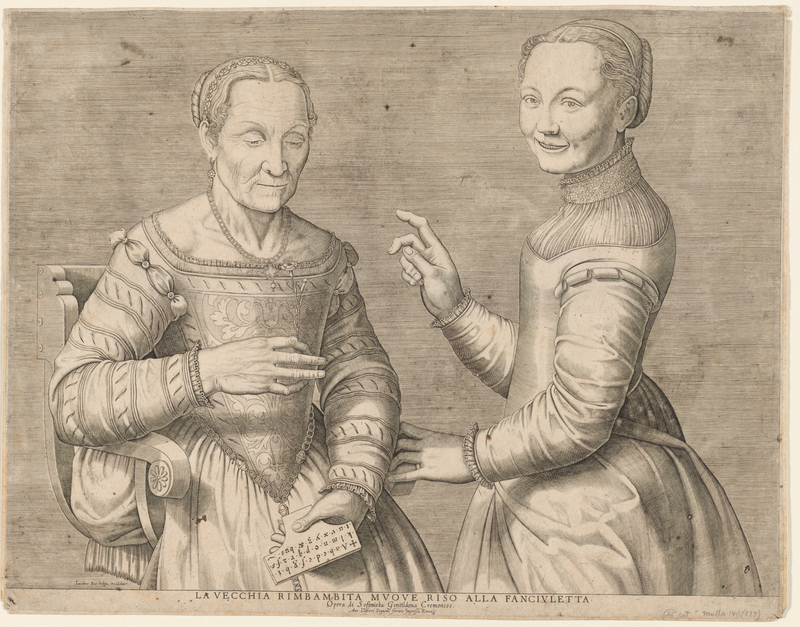 They were arranged in thematic groupings that highlighted the ways in which women were able to learn and practice printmaking, including through family connections, aristocratic leisure, and occasionally actual academic training. Koenen employed an expansive definition of printmaking that was reflected in the range of work shown. She considered all genres and processes from about 1700 through 1815, including both original prints and reproductive prints. Intriguingly, she focused significant attention on “amateurs” in the French sense of the term: women who had the time, wealth and leisure to pursue printmaking without remuneration. More archivally, she also collected portraits of women artists that illuminate the lives of women with artistic ambitions. Sofonisba Anguissola, Young girl laughing at the old woman (ca. 1550), engraving, image 32 x 42.6 cm, sheet 33.5 x 43.4 cm. Printed by Jacob Bos. Published by Antoine Lafréry. The Miriam and Ira D. Wallach Division of Art, Prints and Photographs: Print Collection, The New York Public Library. 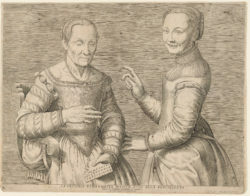 The exhibition opens with these portraits, sometimes paired with prints by the artists in question, to offer what curator Madeleine Viljoen describes as “a picture of the varied paths that led to the celebration of women as artistic creators in the early modern period.”3 In one mezzotint after a self-portrait by Sofonisba Anguissola, the artist meets the viewer’s gaze confidently, sitting before her easel and holding the tools of her trade. It hangs alongside an engraving made in Rome by the Netherlandish artist Jacob Bos after a now-lost drawing by Anguissola of a young girl laughing at an elderly woman. As Viljoen notes, the print’s inscription, which prominently advertises the print as a “work by Sofonisba, gentlewoman of Cremona,” is evidence of the powerful reputation she had established at a time when few women were able to do so. Those few female artists who did make their way into the art historical canon represent several of the highlights of the show. The casual domestic scene in Angelica Kauffman’s Half-length Portrait of a Woman, with a Child Holding an Apple (1763) is a departure from the artist’s better-known portraits and mythological and historical subjects. One of 40 etchings that Kauffman produced, this relatively early work shows an unidentified woman leaning forward from the picture frame while holding a toddler. This genre scene, modest in comparison with the lofty subjects Kauffman contended with in her paintings, suggests that, for her, printmaking sometimes served as a private and experimental practice. In addition to treasures by well-known artists, “Printing Women” was notable for the new artists it introduced into our understanding of the history of the print. Some are figures better known in other contexts, such as Princess Sophie of Saxe-Coburg-Saalfeld, the aunt of Queen Victoria. In one etching study, the teenaged princess freely sketched horses, flowers, portrait heads, her own name and the phrase “la jeune maman” on a copper plate. Her efforts reveal the status of etching as an aristocratic pastime undertaken in private and shared between friends. Jean Baptiste Pillement, Nouvelle Suite de Cahiers de Desseins Chinois, numéro 1 (ca. 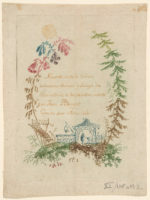 1760), color etching, image: 19.3 x 13.7 cm, sheet 22.2 x 16.7 cm. Printed by Anne Allen. The Miriam and Ira D. Wallach Division of Art, Prints and Photographs: Print Collection, The New York Public Library. In the section on “lesser” genres, such as ornament and illustration, we find the familiar situation of a talented woman artist whose reputation was cast into shadow by the presence of a male collaborator. 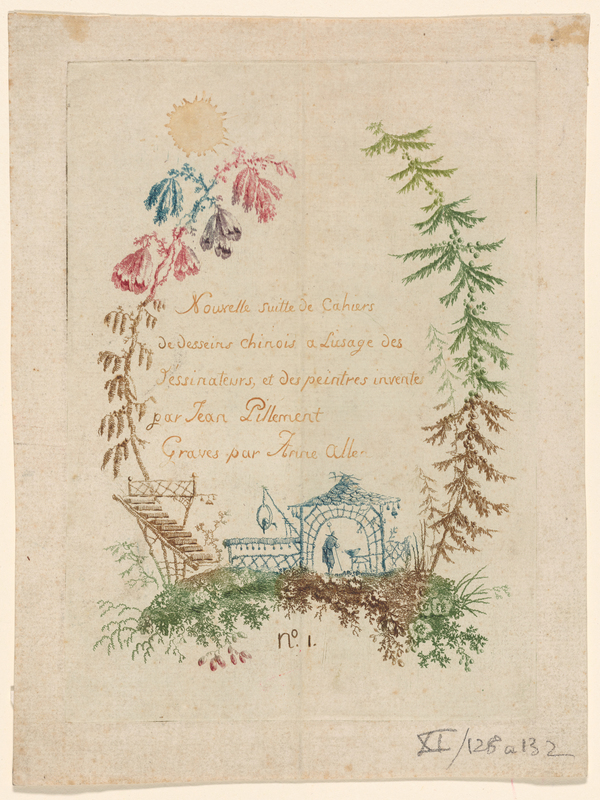 Anne Allen intelligently and thoughtfully translated the decorative chinoiserie designs of Jean-Baptiste Pillement (whom she later married) into etching using à la poupée inking to evoke the color printing of Chinese woodblock prints. In the title sheet from the New suite of Chinese designs (1760), flowers and plants bloom into a decorative border that simultaneously cites Chinese architecture and French gardens. The print’s vivid hues and their precise application testify to Allen’s unique expertise. 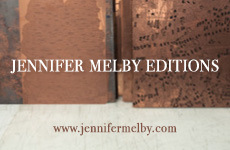 This comprehensive presentation of the accomplishments of women printmakers over the course of centuries offers an important corrective to standard histories of the medium. 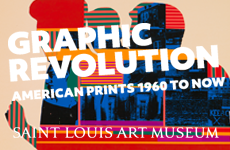 It is the sort of exhibition that is only possible for a venue with a collection as encyclopedic as that of the NYPL, but it is curated in a way that makes these holdings accessible and ripe for discovery. The enthusiastic public response testifies to the need for such a show. 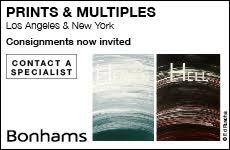 Originally scheduled to end 31 January, it was held over for five more months and was even covered by Artforum, though historic print exhibitions are hardly the publication’s usual fare. Even after its conclusion, on 27 May, its legacy is sure to continue in new avenues of research and fresh thinking about the role of gender in printmaking’s history.